The boys from Boyzone have been charming listeners since the ’90s with their mature approach to pop music. My first exposure to them was in the late ’90s as a kid with their ‘By Request’ greatest hits album featuring heavily in friends’ and families’ homes. That was meant to be their farewell, yet here we are in 2018 with a new and final album. ‘Thank You & Goodnight’ is the band closing the door on a stellar career full of highs and lows, so is it worthy of joining their extensive back catalogue? The lads from Boyzone (now sadly only numbering four after the passing of Stephen Gately several years ago) have often been branded as the Irish Take That, but they tend to stand on their own feet with the way their vocals combine. They remind me a lot more of Human Nature for the range they offer and diversity in their voices. While this quality features here in some songs, in many it’s completely lost. Two songs in particular stand out to me as songs that should have been left off the final set as they massively detract from the quality of the other tunes. Album opener ‘Normal Boy; is one of the worst songs I’ve heard this year. Daggy lyrics and terrible arrangements don’t bode well, but if you press skip, you’re rewarded with quality pop tunes. The string of songs including ‘Because’, ‘Talk’, and ‘Love’ are as good as a modern pop band gets. The songs feel relevant, the boys sound great and it doesn’t feel forced or fake. The lyrics are beautifully written with ‘Love’ featuring work from Gary Barlow and John Shanks. This song featured on Take That’s album ‘III’ under a slightly different name, but I prefer the Boyzone version to the original. Then you are faced with ‘Tongue Tied’. Alesha Dixon features here and has been auto-tuned within an inch of her life. It’s a close second for the worst song of 2018 and I don’t understand why this was even included. Alesha is talented like the boys, but the auto tune distracts from the song making it feel like a Cher song gone wrong. This sudden gear change encapsulates what you get from this album – it’s a mixed bag. Thankfully by the time you get past the shock of ‘Tongue Tied’, you continue down a path of safe pop tunes. The final two songs are amongst my favourite here with ‘Symphony Of Hearts’ providing an epic pop moment with great strings and harmonies and ‘Dream’ taking a Stephen Gately solo demo and turning it into a bright moment for the boys to reconnect again. There’s a real genuineness to the song and it comes across in the way the boys sing. It’s full of love and passion. Asides from a few dodgy tracks I never wish to hear again, the rest of the album fits beautifully into their collection of songs. 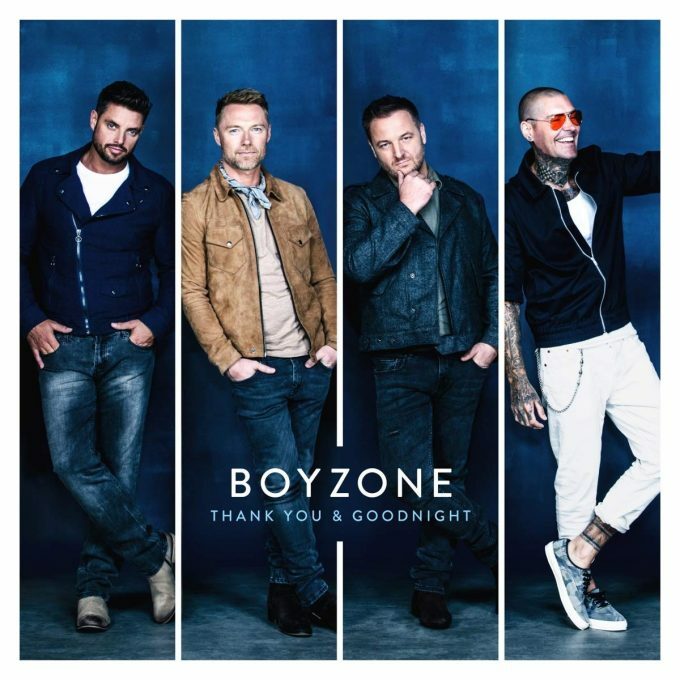 It’s a shame we won’t get new music from Boyzone again, but it’s also a positive when they know the right time to say ‘Thank You & Goodnight’. MUST LISTEN : Symphony of Hearts, Love, Dream.